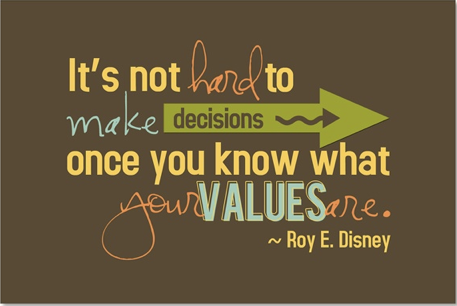 Values are the deep-seated beliefs under which each of us conduct our daily lives. To the best of my knowledge, corporations began articulating their values back in the seventies. In essence, the values of an organization should reflect their cultural norms and dictate expected behaviours. Whether it’s a corporation or an individual, crises are one of the best test of values– regardless of what’s posted on the wall or on the website. Maple Leaf Foods during and following the listeria crisis acted in a way that is completely consistent with their values. So when I read their leadership values, I believe them. I also believe that Maple Leaf employees do. A recent lively discussion in one of my Linked In groups focused on how to communicate corporate values. The old adage “actions speak louder than words” came to my mind. When I am asked to communicate values, I ask one simple question – Why? For longstanding organizations, there has usually been a catalyst that spurs a communications effort. For younger organizations, codifying the values can be a step in corporate maturity and an indicator of growth. Often when I ask, I uncover a problem that management is trying to solve: engagement, reinforcement after an incident, etc. Whatever the reason, the communication of values cannot be adequate unless the behaviour of the organization and its leaders is seen as being consistent with the words. If the value is “do what’s right” and yet bullying is tolerated or (worse) rewarded, the words aren’t worth communicating. If value statements don’t reflect the corporate culture, in a communications effort, they should be positioned as aspirational. Admitting the gaps and taking corrective action in a visible way must be part of the communication effort. The communication of values starts with a tone at the top – the leaders. The corporate anecdotes about them in different situations will carry more weight than any written set of words. If people within the organization believe that there is a different set of values or standards for leaders, the values will be dismissed. Communicating values is also a relentless pursuit and needs to be done expressly and tacitly. For example, are the corporate values reflected in the performance measures people have? When teams are successful, are they praised for working together in a way that is consistent with the values? When an individual is promoted, does the announcement about their promotion include a reference to the corporate values? When an employee speaks out about behaviour that is inconsistent with the values, are they heard or ostracized? Done well and credibly, communicating values can measurably enhance engagement and performance. For those who were at all involved in the Fort McMurray fires, huge lessons were learned not only about corporate, but personal, values. The outpouring of help from across Alberta and Canada, both corporately and personally, restored the faith of a lot of skeptics. We owe a huge debt of gratitude to the first responders for putting their lives on the line through gruelling conditions. We also owe a debt of gratititude to the oil and gas companies for their constant safety training of local employees. Without these, there is no way a city of 88,000 could safely evacuate in 6 short hours. This is spectacular when you realize there is only one highway in and out of Fort McMurray. Without a culture of “do what’s right”, we may have had very different results. I hope, in the event of an earthquake, these same values prevail. Thank you for your comment. I continue to have great faith that when stressed people will do the right thing. Your Fort McMurray example is a great demonstration of collective good. I am believer that personal values provide a moral compass to live by.